Discovering “panini” bread in the bakery section of one of my favorite markets, set this recipe in motion. Once I had my bread selected, I quickly chose the meltiest cheese I could think of, a gooey Brie. 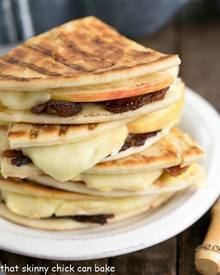 Salty strips of Bacon and thinly sliced crisp apple slices completed my quest for a complex combination of textures and flavors. A smear of mustard added the perfect tang. Sorry, my mouth is watering as I type this.